I don’t have a lot of space in the bus, so I like to have a core set of ingredients I can use multiple ways. 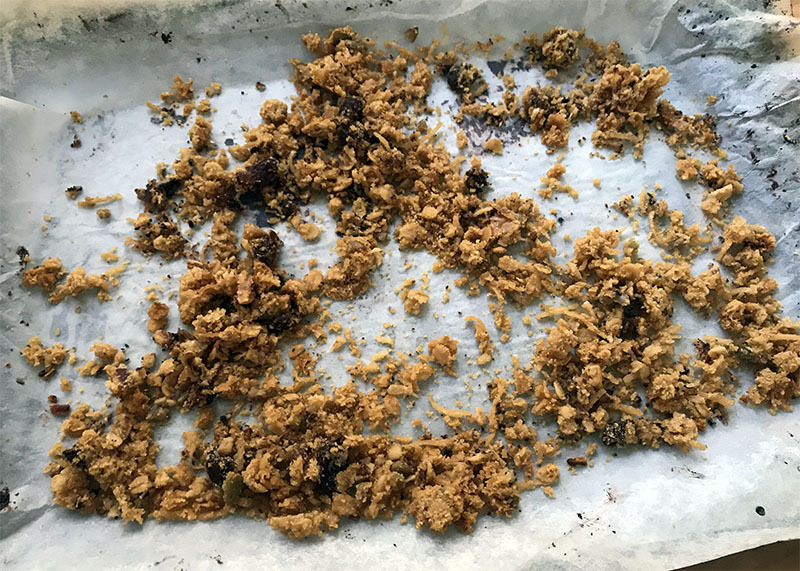 I recently shared a recipe for my Mum’s Anzac Biscuits Rejigged (ie. refined sugar free and much less sweet than mum’s) and based on the comments I received, they were loved by those who tried them. So I decided to use that recipe and have a play around until it became a suitable slice for the lunchbox. The result is this Anzac Lunchbox Slice. 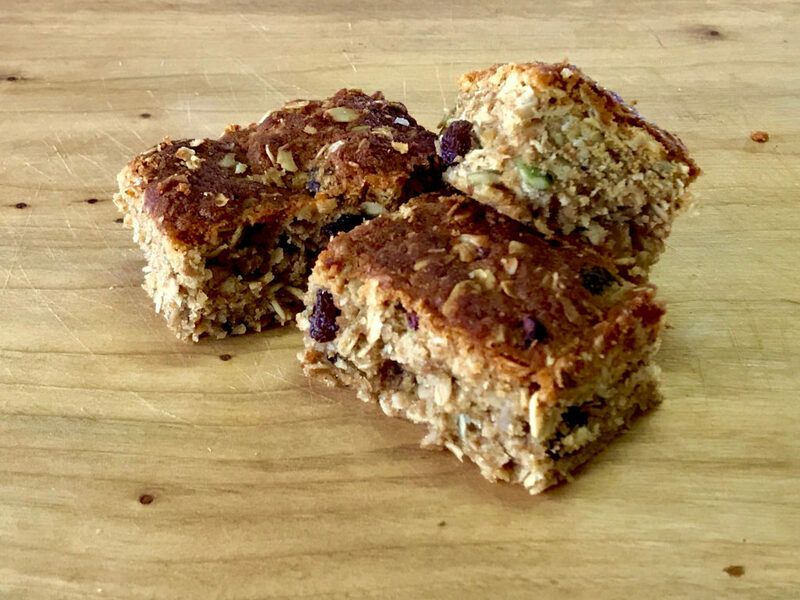 It’s quite a thick filling slice packed with oats and seeds, and a little bit of sweetness. A slice of this would also be great to help fill the gap between school and after school sports training. 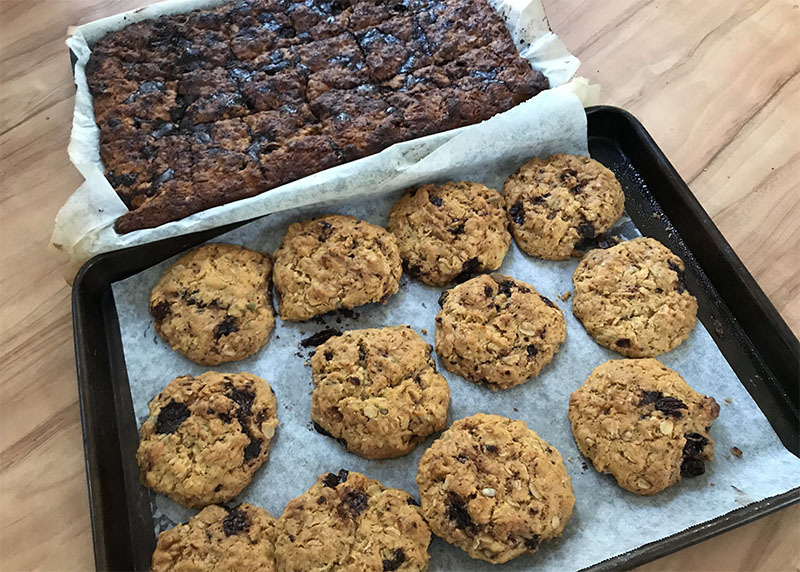 Since making this Anzac Slice, I have played around and created another 2 recipes. Another slice and some biscuits. I have added how to do this to the bottom of this recipe. Add this frothing mixture to the dry ingredients. Stir until all ingredients are wet. Taste if sweet enough for your family. Add more rice syrup if needed. Cool in the pan. Once cool, use a sharp knife to cut the rest of the way down to the bottom of the mixture, then remove the slices out to lamington tray. Place on a wire rack to totally cool. Keep in an airtight container. Can also be frozen and popped straight into lunchbox. I made one batch of this mixture but left out the chocolate chips. Then I took about 3/4 cup of mix to make biscuits, then used the rest to make the slice. This way I have what looks like 2 different snack options from the 1 recipe. BOOM! I call that winning. Make the recipe the exact same way except sub out the cacao nibs for 90% dark chocolate (I used Lindt 90%). Instead of mixing the chocolate chunks through the mix, I simply pressed the mixture into the pan, then spread the chocolate chunks all over the top. Then I used my fingers to press them gently onto the surface. Because the mix was warm from the melted butter, the chocolate instantly started to melt. Then of course, as it cooks, it melts more. Follow the cooking, cooling and slicing instructions from the Anzac Lunchbox Slice above. Note, I think I took mine out of the oven at about 35 minutes. Taking the 3/4 cup of mixture I left aside, I added the chocolate chunks and gave them a quick stir through the mix. It had cooled a bit by this time. Then I took a soup spoon full of the mixture, rolled them in a ball and placed them on tray lined with baking paper. Flatten slightly with your fingers or with the back of a fork if you want to be fancy. Cook at 180 degrees for about 20 minutes. And if you have crumbly bits left over from when you cut your slice, just make out that’s supposed to happen. Toast it under the griller and use it as a topping for Natural Greek Yoghurt and fruit for breakfast. Lots of BOOM happening with this recipe! 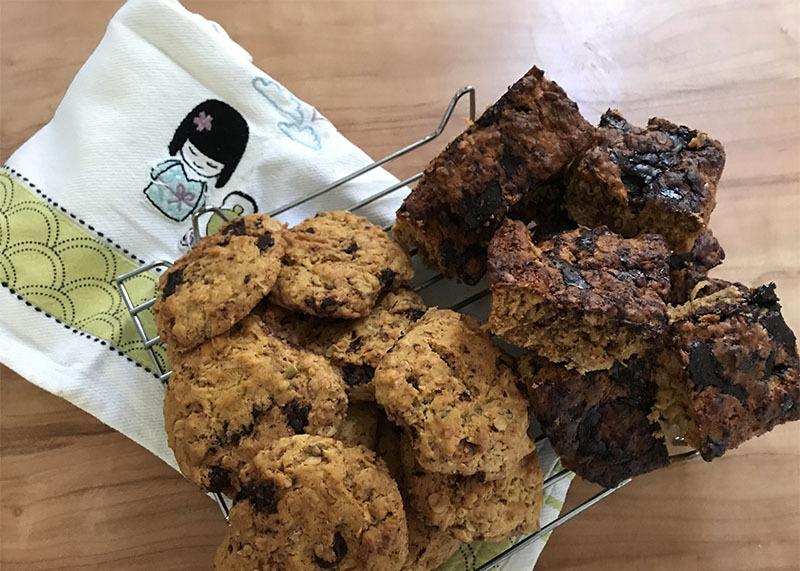 This recipe contains links to our favourite wholefoods pantry store, The Wholefood Collective, who delivers Australia’s most vetted organic and healthy food to members with big savings. Essentially The Wholefood Collective is making affordable organic whole food available for all! We love them. Please do check them out. If you purchase from one of the links from this page, then you get the same great price but the The Wholefood Collective will also send us a small financial thank you – this helps us to continue to keep providing you with loads of free recipes, tips and educational articles. We thank you for supporting us by shopping using these links.